Next up... New Year's Weekend Special. We end it right with our $400 NLH w/ $50,000 GUARANTEED!!! 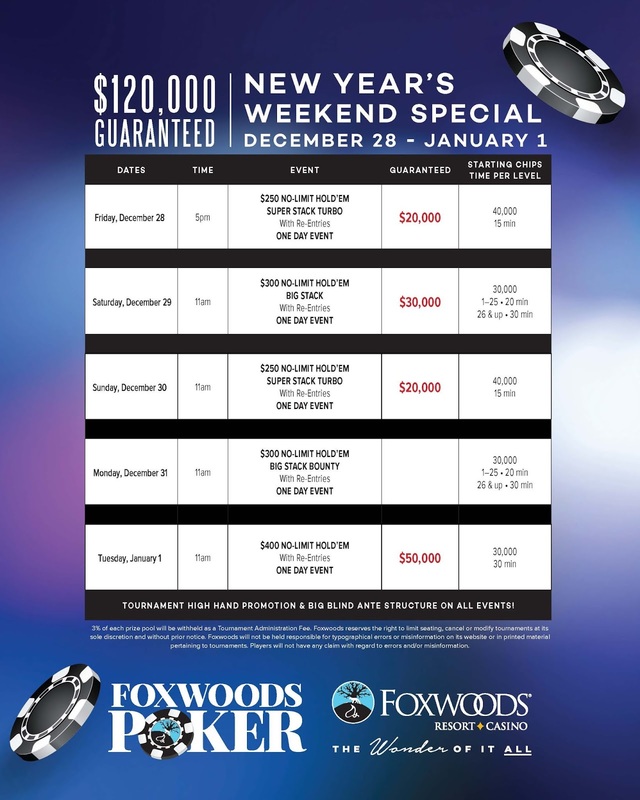 Last year we had 266 entries which created a $89,132 prize pool for our January 1st $400. This year we expect even bigger!! Event #12 $300 NLH Big Stack Results! With the elimination of Tim Domboski in third the final two Championship NLH players immediately began to discuss an adjusted payout deal. Harry Ohannesian was holding 4,620,000 to the 2,320,000 of Bryan Leskowitz. It didn't take long for them to strike a deal and shake hands. Harry Ohannesian will take home $59,235 and the Foxwoods Mega Stack Challenge trophy for his first place finish. Bryan Leskowitz will earn $50,000 for his runner up Championship finish. Below is a full look at the Foxwoods Mega Stack Challenge $1,650 Championship NLH final table results. A full list of all of the Championship results will be posted shortly. Tim Domboski moved all in for 700,000 from the small blind and Harry Ohannesian called from the big. Domboski turned over A♠️6♦️ and Ohannesian showed K♠️J♣️. The board ran out 10♦️8♣️4♥️K♦️9♠️ and Ohannesian paired his king on the turn to score the knockout. Domboski is our 3rd place Championship finisher and will take home $28,513 for his efforts. Harry Ohannesian raised to 90,000 and Tim Domboski moved all in from the big blind covering Ohannesian. Ohannesian snap called for 1,655,000 turning over A♥️K♥️ and Domboski showed 6♦️6♠️. The dealer spread the 10♥️5♠️3♥️ flop and Ohannesian picked up the nut flush draw to go along with over cards. "I like you hand now" joked Domboski and the dealer burned and turned the 7♥️. Ohannesian improved to the nut flush leaving Domboski drawing dead. The meaningless K♦️ completed the board and Ohannesian doubled up to take the chip lead. The players are now on a 15 minute break and we'll pick back up on the action when play resumes. The final event of the Foxwoods Mega Stack Challenge is the $300 Big Stack NLH $20,000 Guaranteed. There were 149 total entries creating a prize pool of $37,578 nearly doubling the guarantee. The final 18 players will all make the money and be guaranteed $601. 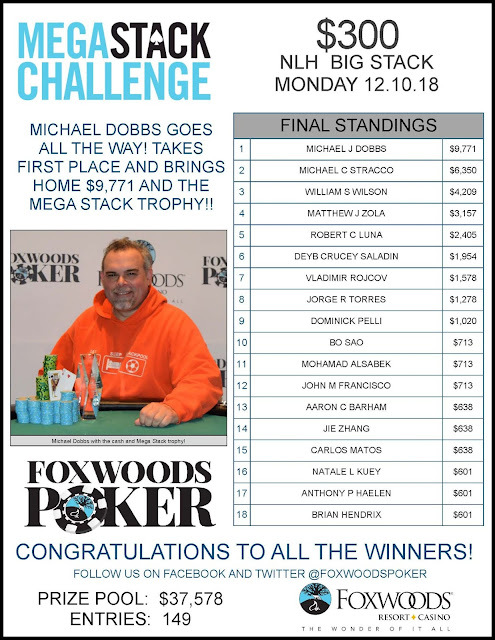 The winner will take home $9,771 along with the Foxwoods Mega Stack Challenge trophy. Below is a full look at the final Event 12 tournament payouts. Anthony Giliberti moved all in from the button for 1,025,000. Bryan Leskowitz folded his small blind and Tim Domboski snap called from the big blind. Giliberti turned over A♦️K♥️ but he was dominated by the K♦️K♣️ of Domboski. The dealer fanned the K♠️5♠️4♣️ flop improving Domboski to top set to give him a hammerlock on the hand. The turn 8♦️ and river 6♠️ were help to Giliberti and he was eliminated in 4th place taking home $21,388 for his efforts. Harry Ohannesian raised to 65,000 from the button and Anthony Giliberti re-raised to 150,000 from the small blind. Bryan Leskowitz moved all in for 1,250,000 from the big blind. Ohannesian quickly folded and Giliberti snap called putting Leskowitz at risk. Leskowitz turned over A♣️K♣️ and it was a classic coin flip situation with Gileberti holding Q♥️Q♠️. The dealer fanned the A♠️10♣️2♦️ flop and Leskowitz paired his ace in the window to take control of the hand. The turn brought the 5♣️ leaving Giliberti drawing to just one out. The J♣️ river improved Leskowitz to the nut flush and he earned the massive double up to move into the chip lead. Harry Ohannesian raised to 60,000 and Bryan Leskowitz called from the big blind. They went heads up to the K♣️10♠️7♣️ flop and Leskowitz checked. Ohannesian bet 65,000 and Leskowitz called. The turn was the 6♦️ and Leskowitz led out with a bet of 100,000. Ohannesian called and the 6♣️ completed the board. Leskowitz moved all in for 750,000 and Ohannesian went deep into the tank. He eventually folded and Leskowitz took the pot without showdown. Tim Domboski raised to 70,000 and Anthony Giliberti called from the big blind. They went heads up to the 8♠️6♣️6♥️ flop and Giliberti led out with a bet of 100,000. Domboski called and both players checked the A♣️ turn card. The 5♦️ hit the river and Giliberti checked to Domboski who bet 250,000. Giliberti called and Domboski turned over A♥️6♠️ for sixes full of aces to take the pot.